A version of this article appeared in The Federalist on April 6, 2018. Large portions of the Palestinian narrative are constructed on a web of fiction and fallacies designed precisely to prevent any compromise and to avoid saying "yes" to a negotiated settlement of the conflict. 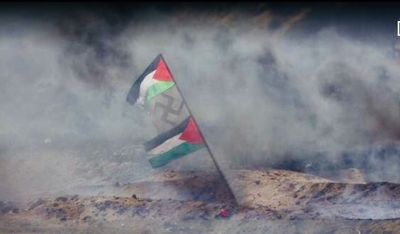 It is as toxic to peace as the tires they're burning in Gaza. I don't want to discuss religion or history because they [Israelis and Jews] are really excellent in faking and counterfeiting history and religion. But if we read the Torah it says that the Canaanites were there before the time of our prophet Abraham and their existence continued since that time—this is in the Torah itself. But if they would like to fake this history, they are really masters in this and it is mentioned in the holy Qur'an they fabricate truth and they try to do that and they believe in that but we have been there in this location for thousands of years. It stood out, even in a speech and conference already chock-full of the typical nuts. Make no mistake: What Abbas said carried far more than the typical anti-Semitic undertones one takes for granted at such venues. It reflects Palestinians' perspective of the core of their conflict with Israel, and it was laced with allusions to a reinvented past that was very accessible to his audience. Understanding this nuance and why these convictions are so deeply held is critical if the United States wishes to avoid repeating the mistakes brought on by three decades of reflexively pushing the same peace process boulder uphill only to see gravity take its toll. It will also contextualize the threat to Palestinian nationalism posed by Trump's puncturing of their sacred mythology. Dr. Nathan Brown, an American scholar of Middle Eastern law and politics at George Washington University, conducted a detailed analysis of Palestinian education since the 1990s in his 2003 book, "Palestinian Politics After the Oslo Accords: Resuming Arab Palestine." He found their textbooks wove a tapestry infusing national identity with religious, family, Arab, and even territorial identity. By 1994, Palestinians finally had what Brown described as "the authoritative voice of a Palestinian state" in which "[t]he Arab and Palestinian nations were eternal entities, stretching back to the beginning of history." That's breaking news for several reasons. First, it switches the role of Ibrāhīm from a Muslim prophet to a non-Muslim while transforming the pre-Islamic ruler and idol worshiper into a Muslim. Of the many implications such a claim would carry, foremost is undermining the religious rite of pilgrimage or Hajj—a fundamental tenet of Islam that was established through Ibrāhīm. It further denigrates the Arab peoples as a whole, since they claim their lineage through Ibrāhīm and his son Ismā'īl. Their nationalist mythology consistently contradicts Palestinian confusion over the prophets in Islam, despite Abbas' reference to "our prophet Ibrāhīm" in his recent OIC speech. Take, for example, the role of Nebuchadnezzar, the Assyrian official who established himself as king of Babylon. In this reanimation of a Palestinian past, he is praised as an Arab for ending the Hebrew or Jewish occupation of Jerusalem in 586 BCE—a thousand years before the birth of Islam. This further muddies the waters by setting pre-Islamic Arabs against those the Qur'an calls prophets. Another sixth-grade unit describes Jerusalem as having always been an Arab city since its founding by "Arab Canaanites," which builds on lessons from the second-grade where students are taught these "Arab Canaanites" built many other cities besides Jerusalem, which they called Yabus. If the Canaanite-Arab association is dizzying, it gets even more convoluted. All pre-Islamic civilizations in the Middle East, not merely the Canaanites, are presented as Arab—Mesopotamian, Sumerian, Babylonian, Amorite, Akkadian, Assyrian. If they simply stopped with Arabizing the past, these textbooks would not fulfill their own mission statement. As Brown found in his research, the books say specifically Palestinian Arabs lived in a state of "Palestine" that has always existed throughout the ages. In reality, no Palestinian state ever existed, a challenge to inventing borders in this fictional past. The books' authors settled on the Christian, colonial borders drawn by the West in the twentieth century. So despite the ongoing attempt to blame a brief colonial past as the cause of what ails the Arab world, the borders Britain and France carved have become sacred. Arafat didn't raise this claim about the Jewish temples once in passing, he raised it frequently, both during and after the Camp David summit in 2000. Multiple Israeli and American sources who were present during those moments confirm this. This is precisely what Abbas was alluding to in his speech when he spoke of Jews "faking and counterfeiting history and religion." It is mainstream Palestinian programming today, a generation after it became official history in their textbooks. This Palestinian fiction not only attempts to undercut any Jewish claim on the Holy City, it also happens to contradict another central pillar in Islam. The Islamic rationale for Muhammad's Qur'anic journey by night (al-Isra) in 620 AD to the Temple Mount is that he was visiting the place where the Jewish temples stood. From there he ascended to heaven (al-Miraj), and preached to Jesus, Moses, and Abraham, all of whom are considered prophets in Islam. There, he received Salat, or prayer. Why would he fly to the Temple Mount if no Jewish temple had stood there? It would seem to be a completely irrelevant location for a journey upon which the earliest claim to Jerusalem's importance in Islam rests. Yet it was not enough to claim the temples never existed and that the Temple Mount was void of any Jewish past. After all, Palestinians were already offered the surface of the mount at Camp David, but they wanted more. In reference to the religious importance in Judaism of the Kotel, a small portion of the entire western, outer retaining wall of the Temple Mount structure where most Westerners visit, Columbia University professor and historian Rashid Khalidi noted in his 1997 book, "Palestinian Identity: The Construction of a Modern National Consciousness": "Precisely the same section of this western wall is considered by Muslims to be the site where the Prophet Muhammad tethered his winged steed al-Buraq on the night journey 'from Masjid al-Haram (in Mecca) to Masjid al-Aqsa (in Jerusalem)'." In other words, of the 1,601-foot long wall, it is "precisely" the 187-foot portion revered by Jews the world over that served as al-Buraq's stable for the night. For those keeping score at home, if stringing together the various strands of Palestinian folklore, one may find there is no Jewish claim at all to the 0.38-square-mile Holy City of Jerusalem because one night, the Prophet Muhammad flew on a winged steed (that is not mentioned in the Qur'an), to the Holy City (that is not named in the Qur'an), in order to ascend to heaven from a place where they claim the temples never existed, to preach to prophets—the leading one of whom was not a Muslim. Seen in the wider context, Abbas' diatribe at the OIC in Turkey wasn't just another anti-Semitic invective. It was a smear against science, an affront to archeology, and a bastardizing of history, all in the service of maintaining a malicious mythology. Likewise, large portions of the Palestinian narrative are constructed on a web of fiction and fallacies designed precisely to prevent any compromise and to avoid saying "yes" to a negotiated settlement of the conflict. 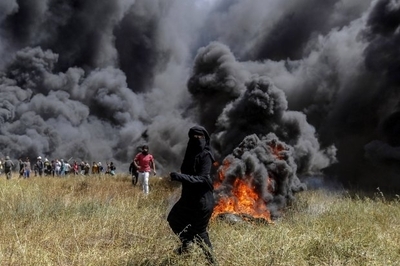 It is as toxic to peace as the tires they're burning in Gaza. It is yet another reason why progress toward a solution will remain a long way off.